WHERE DOES ALL THE BLOWN SAND COME FROM? Nuisance Which is Becoming a Commercial Asset. Portion of Clifton Drive North, near Squires Gate, made impassable by blown sand. NOT for many years has there been so much blown sand in St. Annes as during the past winter. To householders and gardeners it is a nuisance, and to people who use the streets the high wind, carrying dry sand from the shore into the streets, is apt to be uncomfortable and often­times painful. No wonder that at such times the promenade is deserted. But to-day blown sand is not for the Town Council the source of expense it once was To-day, thanks to the age of concrete, sand has a commercial value. Many years ago, when high sand­hills adjoined building areas, it was common to see a board bearing the notice, “Sand may be removed free.’ To-day I believe the price is somewhere round 4s. 6d. a load—and do your own carting. So that when blown sand piles up two or three feet deep on North Drive there is no lack of people willing to clear it away for nothing. Sand Foundation Makes the Town Healthy. When we grumble about the blowing sand we are apt to forget that it is sand which makes St. Annes so dry and healthy in winter. Water percolates quickly through the sandy sub-soil. Similarly, I understand, it is because the wind blows over so much salt- impregnated sand that we get what T. P. O'Connor called “the champagne air of St. Annes. Yet it can be a nuisance. The old Urban District Council found it so. Its removal from the esplanade gardens and streets used to cost hundreds of pounds a year, and a sand shield was built to stop it. During the past winter it has come over this shield in dense clouds ten and twenty feet high, in something of the nature of a Sahara Desert sand­storm. For years this sand has been causing the foreshore to rise, and a fisherman native told me that in the last 30 years the shore has risen 20 feet. Where does all this sand come from and will it ever stop coming? Is it nature's attempt to compensate for the erosion which takes place on other coasts? If one studies old maps and naviga­tion surveys there appear to have always been sandbanks in the Ribble estuary exposed at low tide. The Horse Bank, between here and Southport, was tremendously high, and fishermen have told me that when out in the channels at low tide if they wanted to see the shore they had to climb the mast to look over the banks. Sand and sand banks are never con­stant. Wind, tides and even rains alter their formations, and the sand bank of this year may be the channel of future years. It has often been asked where all the sand comes from, and perhaps the best explanation is contained in the appen­dices to the minutes of evidence issued by the Royal Commission on Coast Erosion and Tidal Reclamation in 1907. “If we turn to the chart of the Irish Sea by Captain Beechy, republished in a reduced form in Beardmore's ' Manual of Hydrology,' we may find a possible explanation. “The tide of the Irish Sea, entering by the South Channel, meets the pre­vious tide entering from the North Chan­nel, creating a maximum rise of the tide at Fleetwood and Morecambe Bay. These tides bring with them sand that has a tendency to accumulate on the South- West Lancashire coast, producing that shallowing of the sea that exists. The accumulation of this deposit on the foreshore gives free play to the winds which sift the grains of sand from the small quantity of mud with which they are mixed." That, of course, is a logical explana­tion for the accumulation of sand on the foreshore at St. Annes. But many people are not satisfied with that. They want to know exactly what sand is, and from whence it came before the tide cast in on our shore. Mr. Mellard Reade maintains that it has its origin in the destruction of the pre-existing Triassic rocks, and inter­mediately, Glacial Drifts and some of the Post-Glacial beds. As a rule, it con­sists of grains much rounded by attrition. Nature may be very wonderful, but she is no conjurer, and for every ton of sand dumped by the tides and the wind on our shores there must, at some place and at some time or other, have been a corresponding loss either on the shores of this country or on the shores of an­other. In short, you cannot have accre­tion unless you have erosion. To a great extent this was borne out by evidence given before the Royal Com­mission in 1907, and one witness, expressing concern at the building of sea walls, told the Commissioners that unless erosion was allowed they could not protect the coast. That, at first glance, may seem paradoxical; but it is none the less true. This particular wit­ness told the Commissioners that, if they put up sea walls, they would ulti­mately be compelled to quarry from other parts to replenish the beach. On the face of it, it seems that, though sand can be an almost intoler­able nuisance at times, it is, in reality, a boon and a blessing. Briefly, we are gaining what other coasts are losing, and this accounts for the constantly changing coast line. 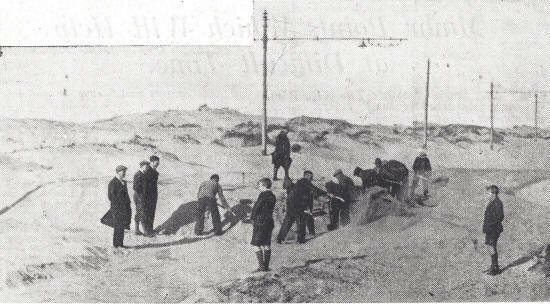 As far as we in Lytham St. Annes are concerned we are not so much in­terested in the accumulation of sand as the best methods of preventing it from interfering with the essential services of the town as it has done in the past. Sandstorms have cost Lytham St. Annes a pretty penny, one way or another, in recent years, and so far we have not been able to effectively combat them. As I have already mentioned, the sand shield did to some extent minimise the quantity of blown sand, but with the rise of the sand banks and the shore much of that benefit has been lost. Then, again, the greatest inconvenience, as is only to be expected, is caused along North Drive, where there is no effective form of protection. Attempts have been made to stop the sand nuisance along this stretch but with indifferent success. Perhaps the most effective method was the old one of planting starr grass, and I have it on good authority that, when this was done by the Clifton Estate, there was very little blown sand on the Drive. Before long we may decide that old methods are best and emulate the action of the Estate by profusely plant­ing this grass. I for one am convinced that by doing so we should lay the sand bogey once and for all.